Hanging curtains but thinking of quilts. I know I've been quiet on the blogfront. My sewing machine has been getting a workout... but not for very exciting sewing. Like most quilters I have a long list of quilts I want to make, and a list of UFO's lurking in the cupboards, and a list of projects underway in various stages. Hidden underneath all these quilty lists there is also an ever growing list of things that need doing around the house... sigh... and I've decided 2015 is the year to tackle this list. The year of the Happy Home! First job on the list was hanging curtains, We have blinds for all our windows so I've been able to put off making curtains, but finally decided the windows do need curtains. It's a a chance to play with fabric after all, Yay! I've collected a few curtains over the years through thrifty finds, so it's been a matter of matching up what I have with the sizes of our windows. 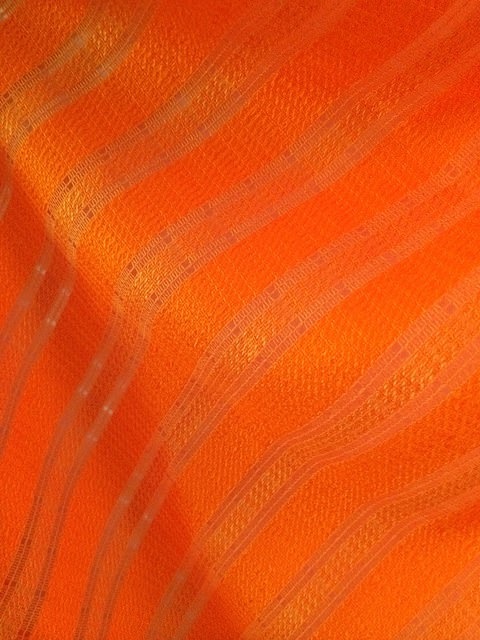 We have a classic early 70's brick house so retro orange is right at home and psychedelic prints are perfect!! 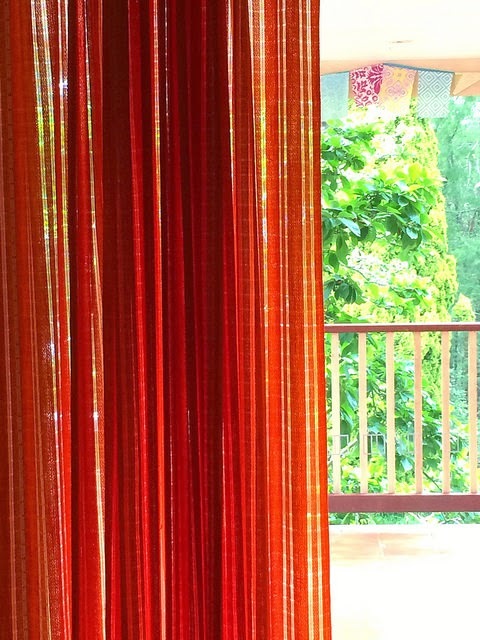 I wrote about these curtains in one of my very earliest blog posts. Any curtains that I don't use will no doubt be sewn into a quilt one day. We haven't got a window to give this bird a home, but he will make a wonderful center for a medallion quilt. The curtains for my sewing room will be a bit more subdued. I figure the neutral colours won't clash with the bright colours that usually cover my design wall. But I couldn't help wishing these curtains had been the right size to fit the sewing room windows, just look at that big daisy! 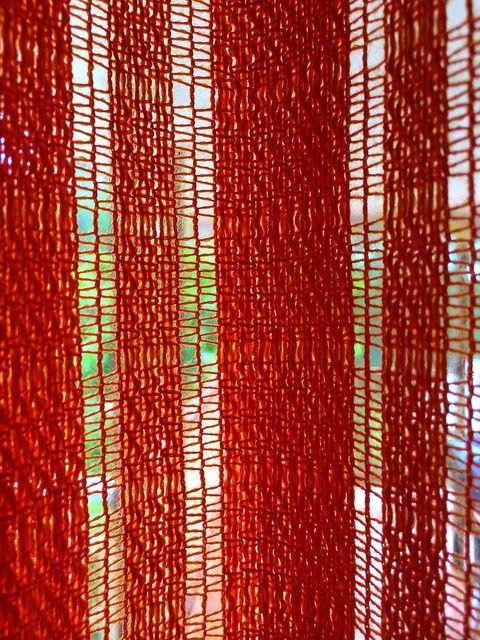 It's hard to photograph the patterns on the sheer curtains I'm using in the office. This curtain fabric caught me by surprise. Usually I'm a flower or geometric type of gal, or love a textural woven fabric, but there was something cute and kitschy about this animal print that said "Take Me Home". 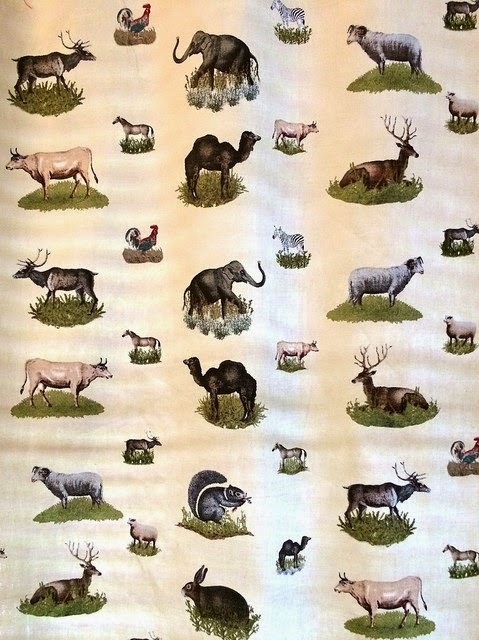 They look great, I like the orderly pattern and the eclectic mix of animals. And every evening when I close the curtains I giggle at the two headed camel made by the edges meeting in the center. So that's me playing with curtains. There's quite a few things that need sewing around the house so you'll be getting more than just quilts this year. I'll leave you with some photos of a visitor I had this morning. 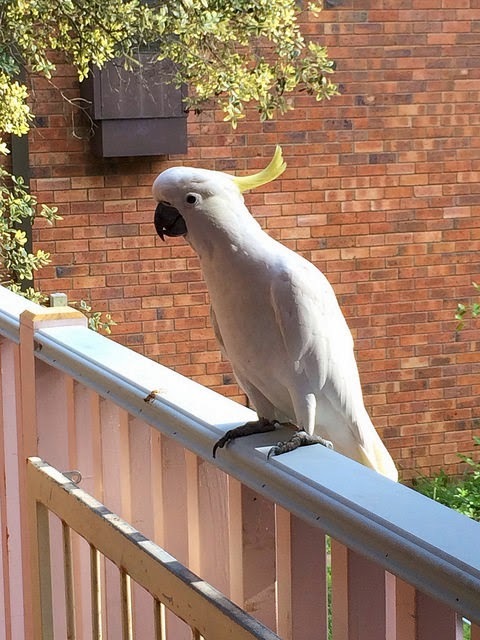 I was painting a cupboard on our deck and this cockatoo was so interested in what I was doing that he flew from tree to tree to get a closer look. Finally came right up to our deck. Where he kept me company while I continued to paint. He finally flew away when some of his friends started screeching in the distance. All I could do was call out "Come back and visit me another day" and hope that he will. The Bird curtain fabric reminds me so much of Kathy Doughty's new feature fabric. What a great collection you have. Curtain sewing is something I can't seem to manage - always getting the lenght wrong. Lets hope your visitor doesn't eat your railings! It sounds like you are having great fun with your curtains. When I was a teenager, we got a new house. My room was lime green themed and by brother had orange. Those orange curtains remind me of his, although they were a bit different. Mine were a chunky lacy style with lime green running through them. 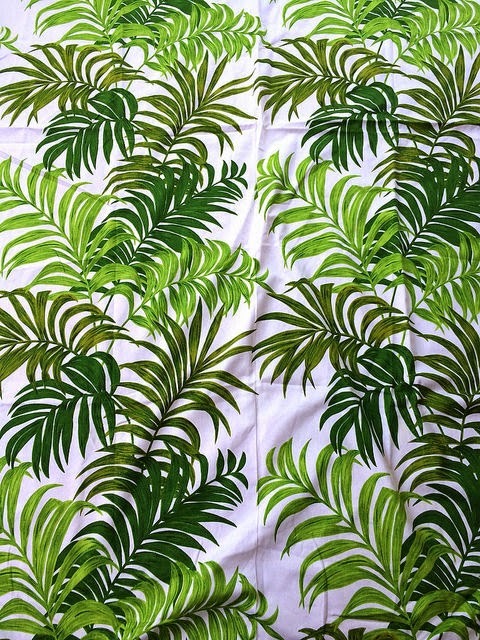 I always loved the fern patterned fabrics. I'm showing my age now. LOL. How nice for the cocky to come and visit. At least you are having some fun while making those curtains! I've certainly made my fair share of those in my sewing career! I love Mr Cocky- do you think he was tame? oh girl what fabulous fabric to work with!!! can't wait to see how it all comes together. 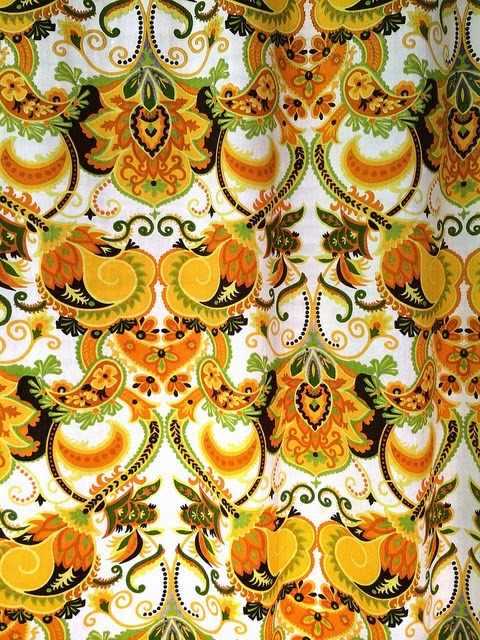 i adore the oranges and the patterns! i love seeing the 70's popping up all over the place. the 2 headed camel. perfect!! the cockatoo. cannot even fathom that! Good luck with all the curtain making. It is not my favourite task. 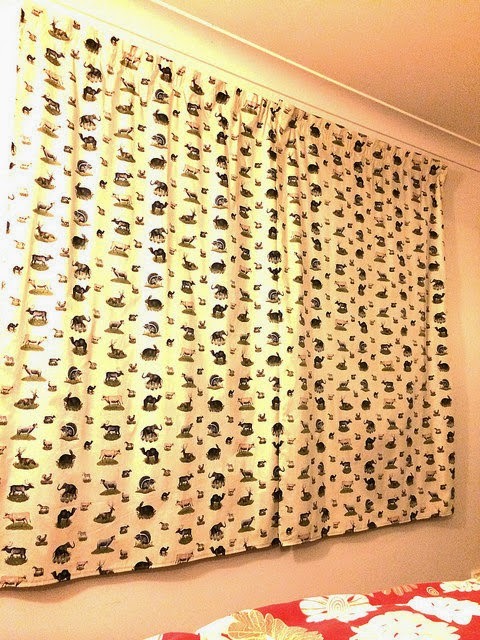 For many years we lived in school houses and each time we moved i had to make new curtains because, of course, no windows were ever the same size. I really like the choices you have made and I think the two headed camel is perfect! And good luck with the painting, too! oh I think we might have had curtains similar to those orange ones in our house !! love the two headed camel and I can definitely see those flower blocks being cut up and used in a quilt !! what fun being able to use cool vintage fabric for your curtains :) I live in a rental with those UGLY column blinds ! Even though you might not be making quilts right now you are making "A Home" and that is fun too! Right not I am in and out traveling (for fun)--so maybe it will recharge my inspiration battery! Yous never seems to end. Love your curtains! They are great! I love that your curtains are all different, yet all so 'you'. 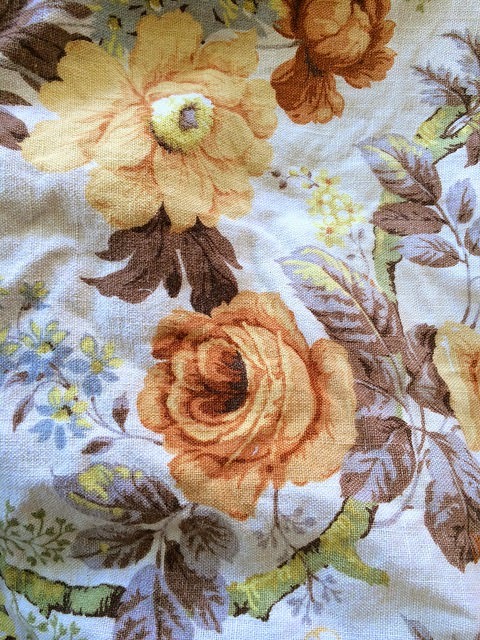 I was looking at my falling down 1980's curtains recently and thinking that they should be replaced. But I think that should be a job for 2016!! Rachael, I love your retro style and love your phrase about a happy home. I've been seeing orange pop up everywhere this year, I wonder if it's the color of 2015 ? 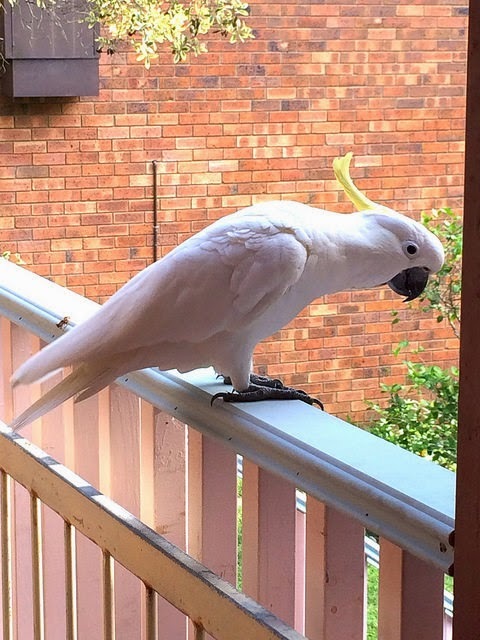 I am in complete awe that cockatoo just flew up to see what your doing ! Here we spend thousands to obtain parrots ! I used to raise and trade a few parrots and cockatiels, what a lot of work, but what a lot of fun ! I love that animal print too! It would never have occurred to me to use it as a curtain, but I'm glad you did - it's perfect! Rachael, The orange curtains remind me of the dress I wore when I was a little girl in 70's! What a beautiful collection of vintage prints. I think making the house fit your lifestyle and nesting is as soothing as making a quilt. I would have never bought the animal print but then again, I love the textural appeal of it when it's hung. You get such exotic visitors! Oh Rachael, your visitor is so regal! I've never seen a cockatoo up close and a visit to Australia is on my list for a family vacation in the next 8 years. Love all the interesting curtains you've collected. We don't have one curtain in our house--it was my husband's home before we got married and blinds are installed everywhere. Curtains are a lot more fun! I've decided to make this the year of the happy home too, but in a different way...I'm hiring a cleaning person. It's too much anymore with three kids and a fourth about to make an appearance. I need a break for a year or two! I don't have any curtains in my house, but I would like to change that this year. You have picked up some gorgeous ones, I love the animal print, and how cool is it that you end up with a two headed camel. I think it is very important to make your home beautiful and comfortable. I need to do some of that too. What a great selection of fabrics! You're so funny -- now I can say I've seen a two-headed camel! Looks like you're having fun decorating your house -- I love stuff like that. I'd really love it if I had a fun bird watching me though -- you lucky girl!!! The two headed camel is actually known as a "pushmepullyou" for those who read Dr. Dolittle in their misspent youth. That would make me chuckle too. Very clever of you to cut and plan it that way!! :-) I am waiting for my mother to finally gift me some fab curtain material when she ever gets around to making her new ones....I also know why we put these chores off. Those finds on the op shop were pure genius...now of course I will be hoarding curtains as well as blankets......one day you will read the news..."local elderly lady smothered by fabric rescuers on the scene, but can only hear the whirring of a sewing machine....she says she will stistch her way out just send chocolate" "details at ten" slow news day of course. Hahahaha. Love your happy accident of the two headed camel, it lined uo so well. Your cockatiel photos are great, my girlfriend used to have a pair of greys but I never took any pictures of them. I can't think of anyone else who could make curtain sewing look like fun. You had collected some fun fabrics. I had a downy woodpecker at my bird feeder today which is nothing compared to your cockatoo and, of course, to your two headed camel! The birds & beasts of Oz amaze me! We have greenish Monk Parrots -- released or escaped pets that now have populations all over the US. But no cockatiels or kangaroos. I'm not much one for curtains, but if I found some of that crazy animal print, there might be one window in my home properly dressed! It looks like you've been having fun creating curtains! 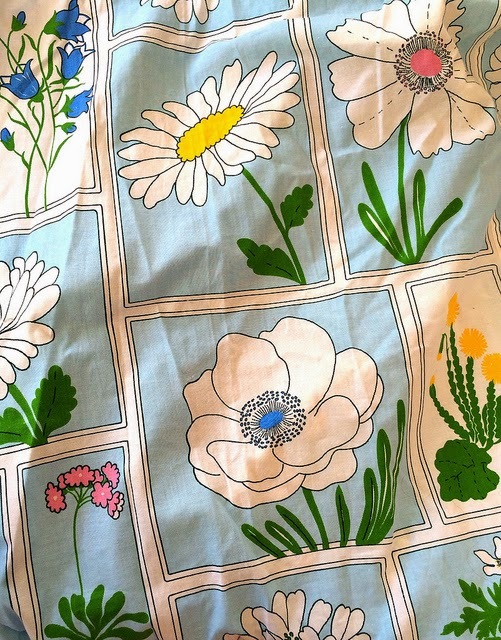 And I can see why you'd start dreaming of quilts with those fun fabrics, especially the daisy one. How cool is that to have a visitor like that?? All of your window coverings look great! Home Dec fabrics are so fun to include in quilts. I look forward to your 2015 projects! 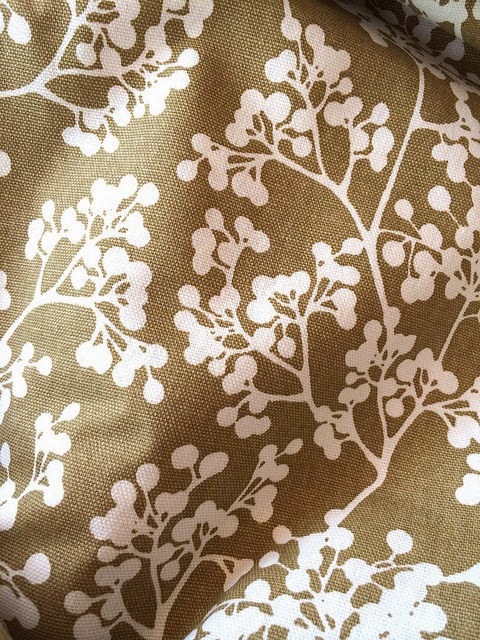 What a great fabric collection you have for curtains! Although I would expect nothing less from you! I always tend to put off making curtains too. There is always something not quite right about mine. Maybe I just need more practice. Lovely shots of the cockatoo. They are so cheeky! Thanks for the walk down memory lane. Your wonderful mix will look great in the house. God to see you back, Rachael. 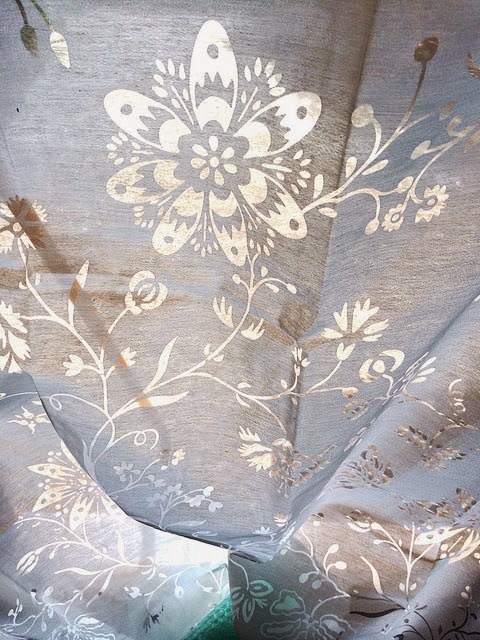 I just adore every single curtain you have shown us on this post - makes me want to rush out to the second hand stores and start rummaging for some of my own - must do that tomorrow! 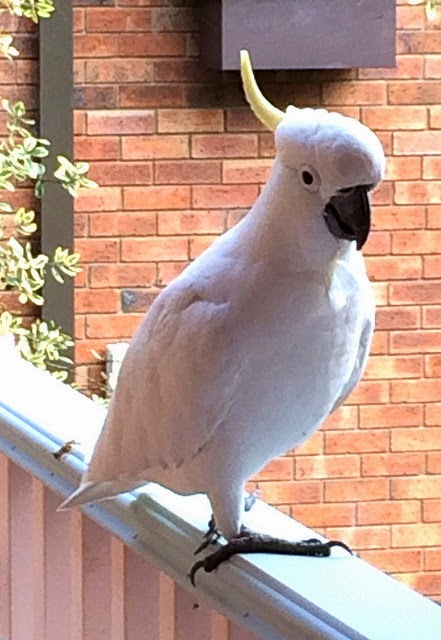 Hope that cockatoo somes back soon! You have collected such fun curtains! It will be so nice to see them everyday. Best wishes with the home projects. I'll look forward to seeing them! Such a fun collection of curtains and fabrics. I just love the bird print, perfect for a medallion center. Thank you for the out loud laugh at your two headed camel!! You couldn't have done that if you'd tried! 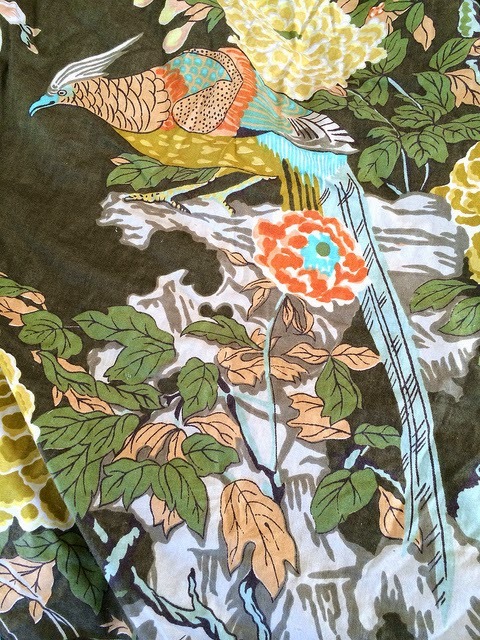 Great curtain prints - particularly love the fabulous bird. What a lovely visitor. So now you have a museum of marvelous curtains! You are a living breathing fabric archive Rachael. Your eyes must be like lasers when you go to an opshop, boring through racks and shelves to find the treasures. Wonderful curtains Rachael. OH MY!!! To have such an exotic bird visit is incredible!! I love him - wow. I love your curtain fabrics. The birds and animals are my favorites, but the plants and flowers are lovely too. You have such a great eye for color and pattern. Have fun with your house projects! 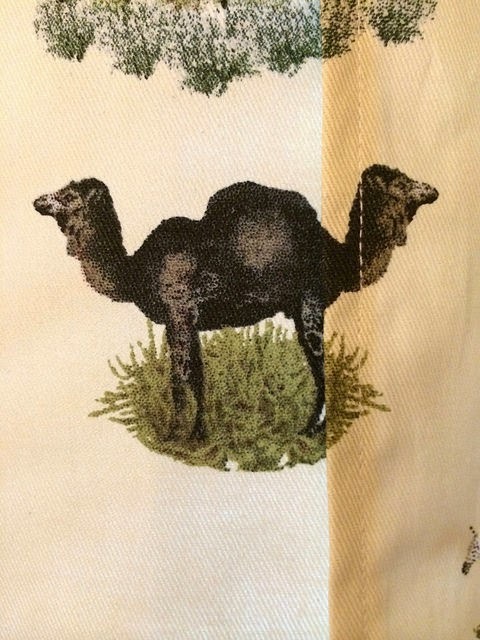 You couldn't have planned the two headed camel any better! Love it!Yep that bird would make a great quilt centre. Much more exciting than being a curtain. I hope you get them all done before you run out of mojo. Sounds like a lot of fun there Rachael with your curtains.....the daisy fabric is so you! Hope your visitor does come back...I'm sure hewill!